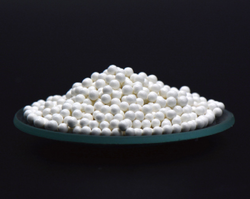 Our product range includes a wide range of zta zirconia toughened alumina beads & balls, sintered and zirconium beads (zirconia alumina composite beads)- zal-27 and zal-32. ZAL-32 / ZAL-27 beads are unique products, developed by CHEMCO expert R&D team after many years of research and hard work. The patented formulations combine the good properties of two advanced ceramic materials (ZrO2 & Al2O3), bringing beads excellent toughness as well as outstanding breakage resistance. Higher density of the media compared with glass could increase the milling efficiency. And the smooth bead surface offers extremely low wear to the mill internal components. Thus these beads can substitute glass beads very well. Looking for Zirconia Alumina Composite Beads ?